Designer 3.2 cu. ft. Compact Fridge in Black - ENERGY STAR® Ideal for lunchrooms, small kitchens, wet bars and dorm rooms, this compact refrigerator from Danby can be adjusted to the same height as your rooms countertop. It comes with a full-width freezer section for frozen foods, easy-to-use temperature controls and the patented CanStor<sup></sup> beverage dispenser system. Best part? You won't need to worry about anymore sky-high electricity bills - this mini fridge also boasts an ENERGY STAR rating. Designer 3.2 cu. ft. 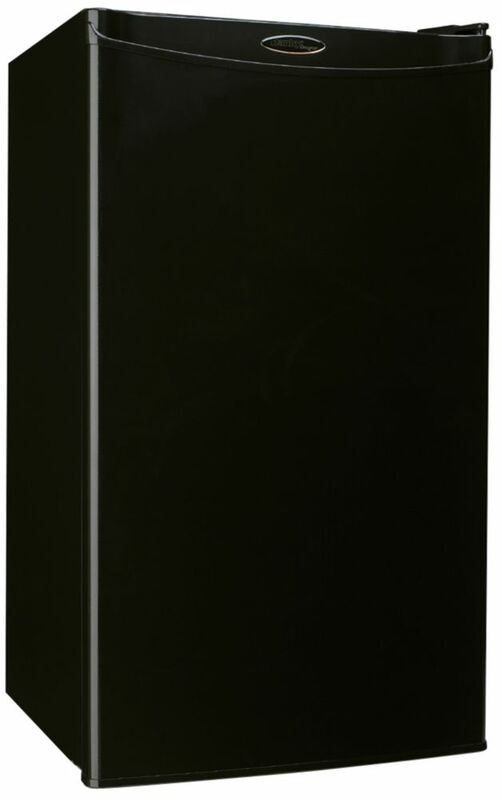 Compact Fridge in Black - ENERGY STAR® is rated 4.9 out of 5 by 7. Rated 5 out of 5 by Brittany from Amazing! This was the first mini fridge I've ever bought and it works perfectly! Couldn't find one problem with it and I'm really glad I bought it. I highly recommend getting it! Rated 4 out of 5 by greasy from great little fridge I use this fridge in the man cave and it preforms great. WE keep lots of cola and some beer ice cold. Rated 5 out of 5 by RGale from One Fantastic little Refrigerator Fantastic for the soft drink crowd but do be careful. This little guy works so well, the first couple days it FROZE my Pepsi cans solid! It took me a little time to learn how much to adjust temp to keep from freezing soft drinks. It is MUCH better working then my last two mini-refrigerators. Love it! How is this fridge for noise? Planning to buy one for the office. It's pretty quiet actually. Sometimes I forget it's even there.